Having room to move, soft lighting, and the right atmosphere as you get ready for your wedding is an important part of starting your day with low stress and good vibes. Having been a part of this experience for hundreds of brides, I’ve seen how this can make or break your day. Here is a list of some of the best places you can choose to get ready for your wedding in New York City. You’ve picked your date. You have the perfect venue. The catering is all sorted. You have an amazing dress. Your bridal party is confirmed. Invitations are out. Even your honeymoon is all set. You know that your wedding day is going to be incredible. Then you start to picture it…You and 6 of your best friends – plus your mom and your partner’s mom – cramped in a hotel room, trying to put yourselves together for the biggest day of your life. Hmmmmmmmmmmm…this doesn’t feel right. Ok, you get TWO hotel rooms so everyone can have space…that doesn’t feel right either! Arghh!!!!! With two living areas, a large dining table, full kitchen, and a relaxing decor, the Buttonwood is perfect for large bridal parties (Other premium suites are great as well). Plus the location downtown is convenient for getting to venues on either the east or west side of Manhattan or even Dumbo. The W Hotel has amazing views of New York City and Union Square and the Fantastic Suite, in particular, can comfortably fit 6 or more girls getting ready together. With huge mirrors, a massive window and plenty of table top space for all your things, this suite will give you a comfortable and convenient way to start your day. If you’re looking for some extra character for your prep spot, the W is great with quirky rooms all around. It’s central location doesn’t hurt either. Want to feel rich and powerful on your wedding day? 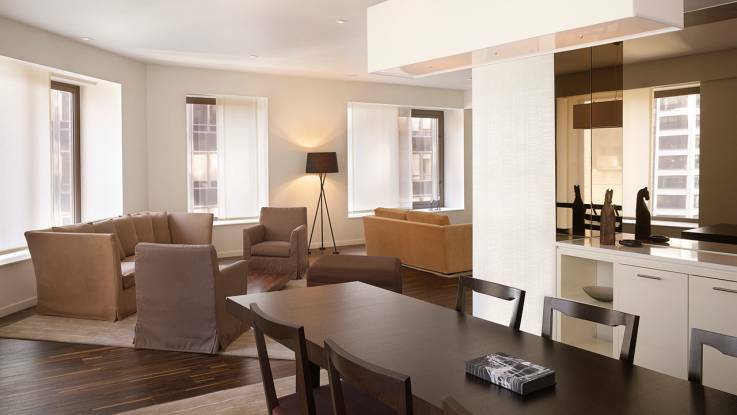 With the incredible views of both Manhattan and the Hudson river, the large, contemporary suites at Ink 48 will make you feel like you’re in your own apartment looking over a city that belongs to you. The floor to ceiling windows provide amazing natural light, showing off your beauty and a giving you confidence on your big day. 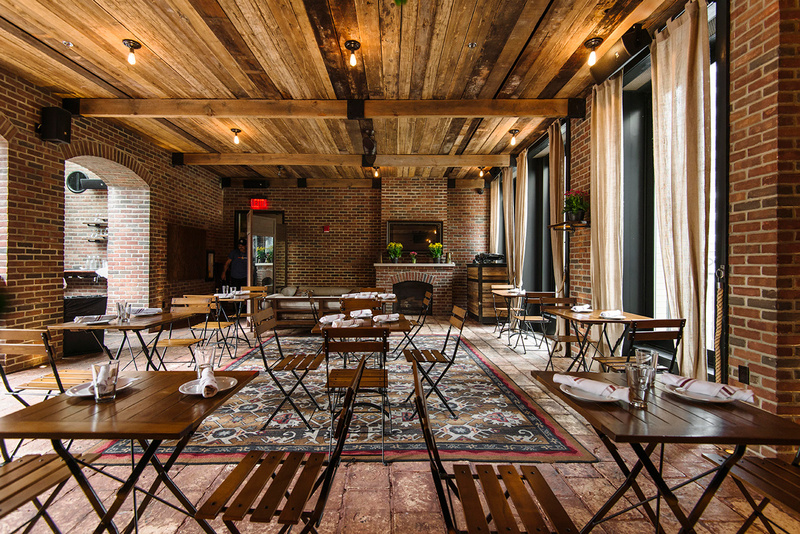 The rustic, intimate vibe at the Refinery hotel will have you feeling right at home in your country cabin…in the center of Manhattan. With its large rooms, large mirrors, and central location (midtown), The Refinery amazingly comfortable and convenient. 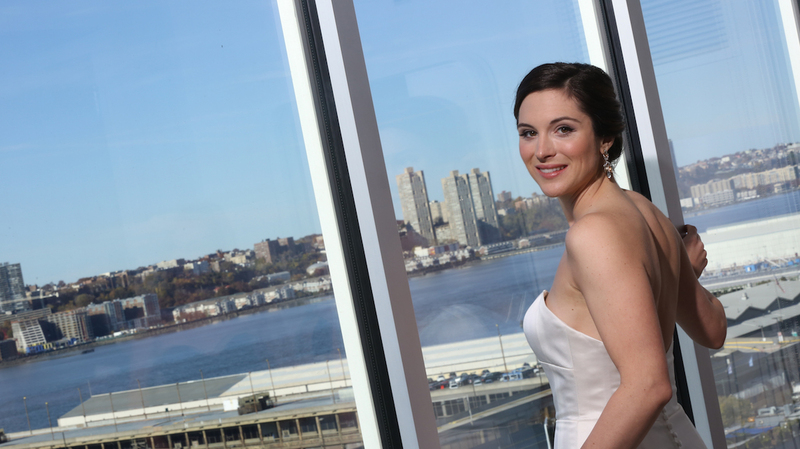 The added bonus of the rooftop bar makes the Refinery a huge winner for any wedding day experience. Only an honorable mention because it’s not actually IN Manhattan, but – oh my goodness – what a spot! With spectacular views of the Manhattan thanks to floor-to-ceiling windows and the ultra-chic modern style, the W is as trendy as trendy gets. You will feel rich and fabulous getting ready here without the rich-and-fabulous price of a Manhattan hotel…and the drive into town is just minutes.